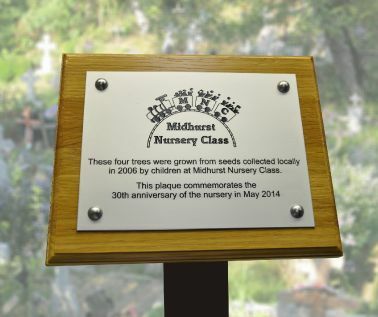 Celebrate an occasion or event in a lasting way with our Aluminium Commemorative Tree plaque. Aluminium is a more modern material than brass, and although less durable than stainless steel, the anodized surface still makes it ideal for exterior use whilst a simple wipe with a damp cloth from time, will maintain the plaques appearance. Supplied in a satin silver finish, we use 1.5mm thick material complete with bevelled edges (other thicknesses are available). The text is often filled black to give a prestigious contrast to the Aluminium, however other colours can be requested. Our Aluminium Tree Plaques are supplied complete with 4 x fixing holes and screws and a Accoya wood base of your choice which is suitable for mounting to a stake (stake not included). 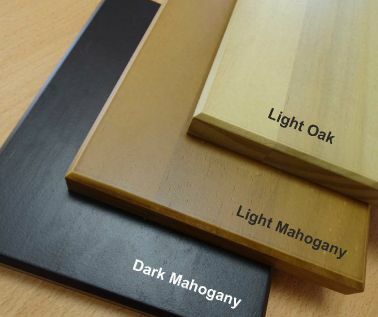 Accoya bases, from sustainable forests, are supplied in either light or dark mahogany or light oak finishes. All bases are supplied with a 45° bevelled edge and are finished with two coats of exterior lacquer. 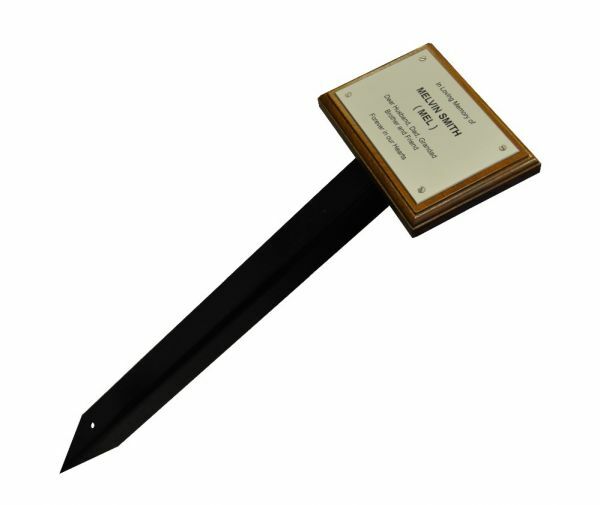 Logo’s, borders and a metal stake can all be added to enhance your Commemorative plaque. The standard border incorporates scalloped corners which surround and highlight the screws. We offer a metal ground stake which is available to order at additional cost or you can choose to supply your own. Stakes measure approx. 23" high and we recommend that they are sunk into the ground by 12", to view please click here. When receiving your tree plaque it will arrive fixed by screws to the Accoya base. Larger plaques (from 8" x 6") are supplied with domed covers to the screws. Fitting, remove the nameplate from the base. Drill the wooden base in a suitable position to line up with the top of the stake or stakes. Screw the base to the stake using a minimum of two screws and refit the nameplate to the base. There may be a requirement for two stakes for the larger size plaque. 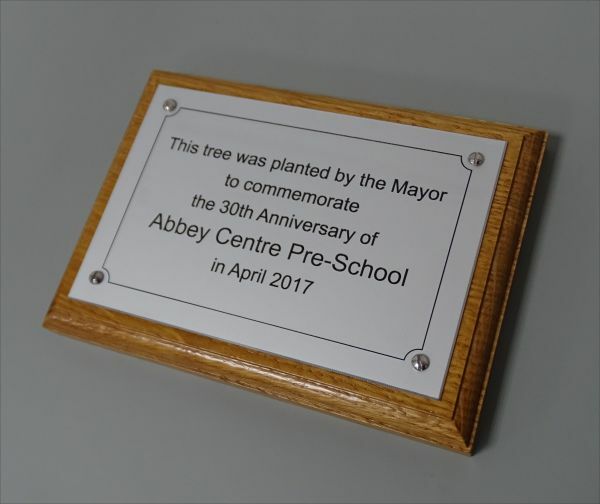 Aluminium commemorative tree plaques are supplied fixed to a Accoya wood base of your choice, using 4 x stainless steel screws. Sizes 200 x 150mm and above are supplied with brass screws and satin silver domed cover caps. Suitable screws are also included for customers who purchase the optional ground stake. To view a video on how to fit your nameplate to the ground stake, please click here. *Logos/Images/Crests may attract an additional charge dependent on complexity & number of colours. Our Aluminium plaques are supplied in a satin silver finish and anodized to an exterior grade. The material will not tarnish or rust and requires minimal maintenance. A wipe from time to time with a clean damp cloth should be sufficient however for more stubborn stains we recommend Peek, a metal polish that will restore and maintain your plaques appearance. 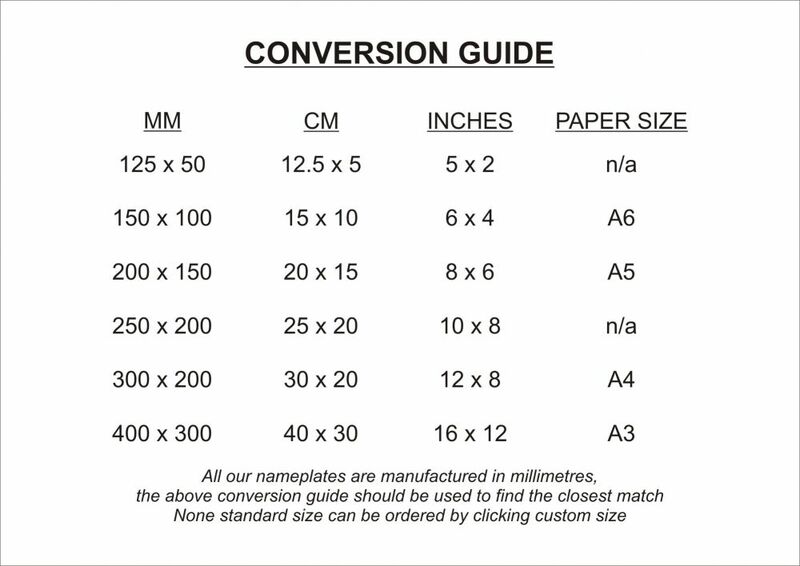 All our nameplates are listed in millimetres, please click here to view a measurement conversion guide. Please enter your text in the box below, a simulated image is displayed to the left to assist you. Please note the image is only a representation and our professional designers may choose to amend the layout, we suggest you request a proof if you would like to confirm the exact design. NB: All text will be copied and pasted from your typed engraving details. * NB: Your image/logo will be re-drawn into an line/silhouette format. 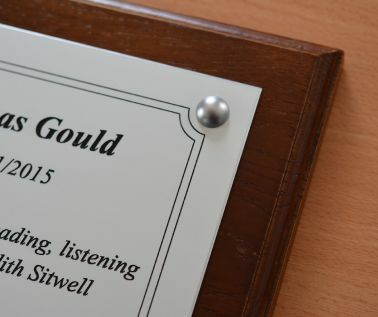 For full colour photos please click here to view our photo plaques. Multicoloured logos may attract an additional charge dependent on complexity & number of colours involved. We will contact you if there is an issue. For a limited time only, we are offering a discount on our metal ground stakes. STEP 8 - Would you like to see a proof prior to production? Would you like to receive a proof?